Pink and Gold Birthday Outfit. Personalized with your baby's name. Available for all ages and sizes! 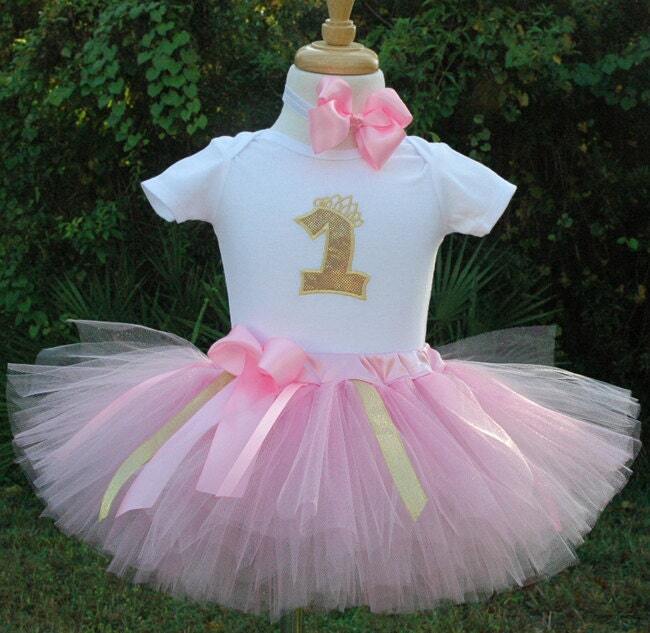 Beautiful First Birthday Tutu Outfit Girl, Pink Tutu with Gold number 1. This listing is for a tutu,shirt and bow. Lets say the time just got away from you! No problem! Rush orders------Send me a message at : www.tutuusa.com and let me know how soon you needed for. Available for all ages please message me for details. Shirt features the number 1 gold in a gorgeous sparkly gold fabric. It is sewn by an embroidery machine on the the shirt or onesie. Your baby girl's name will be embroiderered in gold thread across the 1. Or it can go underneath the number 1 please message me if you would like it that way. Otherwise we will embroider it across the number 1. Tutu skirt has been created with soft high quality tulle. Hand cut tulle in many soft pink colors including sparkly pink tulle. Beautiful pink and gold strands of ribbon surround the tutu. Gorgeous soft pink long bow in front of the tutu. This beautiful tutu is very full and has been sewn not braided! The beautiful boutique hair bow is made with light pink satin ribbon and attached to an elastic band white in color. The elastic white band measures about 2/3 of an inch in width. Is very comfortable and looks beautiful. These tutus are so full! It's amazing.